The ability to accurately achieve performance capture of athlete motion during competitive play in near real-time promises to revolutionize not only broadcast sports graphics visualization and commentary, but also potentially performance analysis, sports medicine, fantasy sports and wagering. In this paper, we present a highly portable, non-intrusive approach for synthesizing human athlete motion in competitive game-play with lightweight instrumentation of both the athlete and field of play. Our data-driven puppetry technique relies on a pre-captured database of short segments of motion capture data to construct a motion graph augmented with interpolated motions and speed variations. 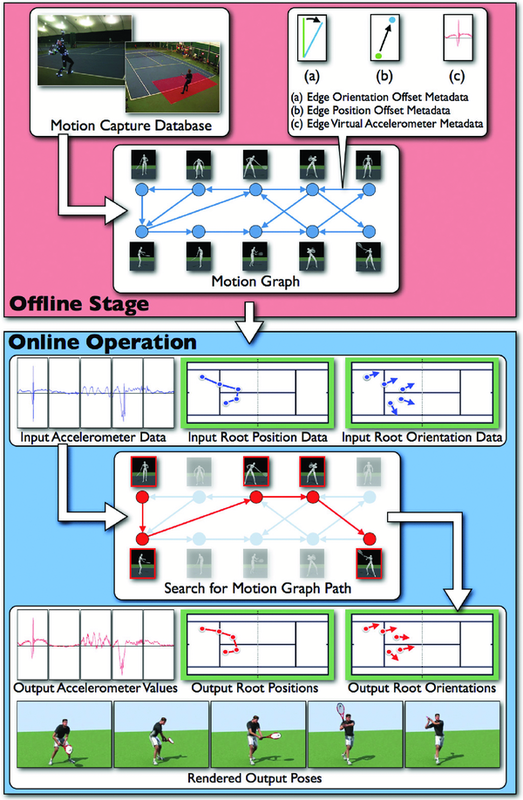 An athlete's performed motion is synthesized by finding a related action sequence through the motion graph using a sparse set of measurements from the performance, acquired from both worn inertial and global location sensors. We demonstrate the efficacy of our approach in a challenging application scenario, with a high-performance tennis athlete wearing one or more lightweight body-worn accelerometers and a single overhead camera providing the athlete's global position and orientation data. However, the approach is flexible in both the number and variety of input sensor data used. The technique can also be adopted for searching a motion graph efficiently in linear time in alternative applications. P. Kelly, C.Ó Conaire, N.E. O'Connor, J. Hodgins (May 27, 2013). Motion Synthesis for Sports Using Unobtrusive Lightweight Body-Worn and Environment Sensing. Computer Graphics Forum, 32(28).